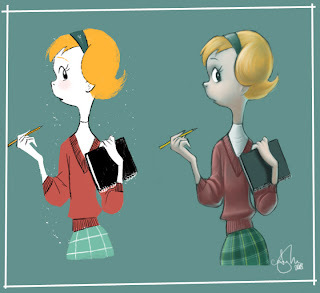 Two styles - quintessential fifties scratchiness (still trying to nail a good drybrush/rough pastel in Photoshop) and a method completely aping Tracy Butler, because her art is like crack. Nice work on that 50's style scratchiness! And the same goes for the rest of it, sister. Nice nice nice work. Hi AMY (waves)! How ya been missy?! I life the colouring stylins!